Pressure cookers are great to have in any household. Their main benefit is that pressure-cooked food are more nutritious, because they are cooked faster and less liquid is required. The longer a food is cooked and the more liquid you use means that nutrients are destroyed and the liquid carries most of it away. When you use pressure cookers, you save up to 70% time, plus the food will retain its original flavor making it tastier and more delicious. It also saves you time for food preparation- you just need to put in all the ingredients without cutting and let it do its business. Saving time cooking also saves you money by using less electricity or gas to cook meals. 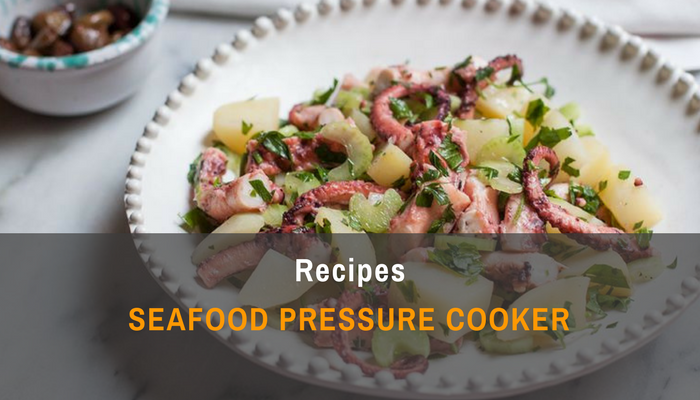 With pressure cookers you may also wish to prepare seafood which is healthy and delicious in its own way. Here are three seafood pressure cooker recipes that you can try out and experience with your friends and family. Included are the ingredients, serving size, instructions and nutrition information. Enjoy! Rinse rice three times in a bowl. Add 2 tablespoons sesame oil, then the rice, water and soy sauce to the pressure cooker, then cook rice. Rinse the shrimps under running water for two minutes, thaw then drain. When the rice is done, let the pressure release naturally theen after 5 minutes, quick release and safely remove the lid. Stir in the rest of the sesame oil then set it to high or press saute on your pressure cooker with the lid off. Add the shrimp, frozen peas and green onions, stirring constantly for 2-3 minutes until shrimp is pink and curled. Make sure peas are done then you may turn it off. Serve immediately. Total Fat 14g at 22% DV. Dietary Fiber 3g 12%, Protein 6g. Sugars 2g, Vitamin A is 15%. Vit C is also 15%. Percent Daily Values based on a 2000-calorie diet. Make your own clam juice. Fresh clams can be juiced by putting a cup of water in your pressure cooker and adding the steamer basket with cleaned clam shells in it. Close the lid then set it to high, and when it reaches the pressure lower it to minimum heat then cook for 5 minutes. When done, pour cold water then open the clams, setting the meat aside, to drain the juice. Frozen clams and Canned clams can be drained to instantly give juice. Add bacon to the pressure cooker then turn on the heat at low setting. Once it releases fat and begins to sizzle, add the onion, salt and pepper then raise to medium heat. Add wine then let it evaporate almost completely, add the diced potatoes then the clam juice, if it does not reach 2 cups then add some water. Add the bay leaf, thyme and cayenne pepper. Close and lock the lid then turn to high heat and once pressure is reached, lower to minimum heat while maintaining pressure then cook for 5 minutes. When done, open it to release the pressure. 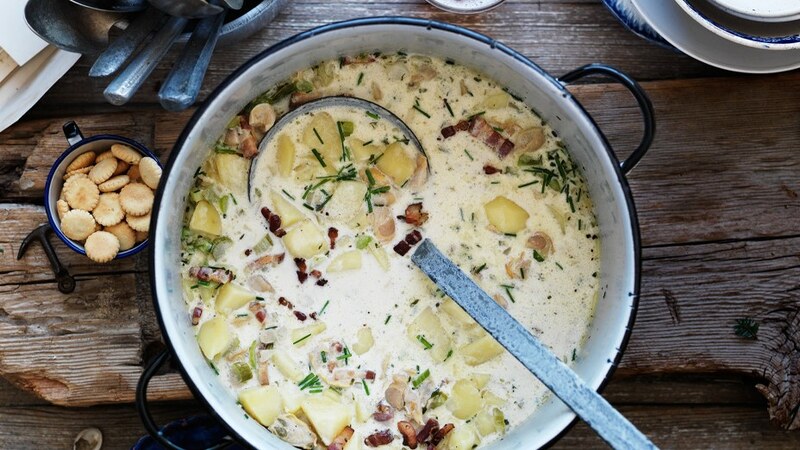 Make a roux by blending equal amounts of butter and flour to make a roux for thickening the chowder. Stir constantly to ensure they are well blended. Add the clam meat, milk, cream and roux then stir well, simmer all of the ingredients with the lid still off for 5 minutes. Serve best inside a bread bowl or garnished with soup crackers. Remove the head of the octopus, slit in half then turn inside out, remove the eyes and beak in the center then rinse under running water. Wash and scrub the potatoes then place whole in the pressure cooker. Add water with a pinch of salt, enough to cover them halfway. Close and lock the lid then turn to high heat. When it reaches pressure, lower the flame to minimum then count 15 minutes cooking time under pressure. When done, release the vapor then remove the potatoes using tongs then peel while still hot as it is easier to do so. Use tongs and a fork in the process. Preserve the water. Add more water enough to cover the octopus, then the garlic clove, bay leaf and pepper then bring to a boil before putting the octopus. Close and lock the lid then turn to high heat the set to low once pressure is reached, counting 15 minutes again. Once done, release the vapor and check the tenderness of the octopus. It’s done when a fork sinks easily on the thickest part of the flesh. If not, close the lid then cook for another minute or two then check again. When done, remove and drain it then take off any remaining skin. Chop the head and tentacles into bite sized pieces. Prepare the vinaigrette by combining 1/2 cup olive oil, 4-5 tbsps white whine vinegar and two crushed garlic cloves in a jar then shake to blend. Dice the potatoes then mix with the octopus, cover in vinaigrette then sprinkle with chopped parsley. Serve and enjoy.